During my summer wanders through America, one day I looked up and saw a giant mural of men with long queues down their backs and conical hats on their heads constructing a railway. Standing in the main hall of Union Station in Ogden, Utah, I was not far from where America’s transcontinental railway was completed in 1869. In the second half of the 19th Century, the American dream was a magnetic force that tempted many from their ancestral homes. Several branches of my own family tree, downtrodden coal miners and farmers, were tempted from England and Sweden across the Atlantic during this period. 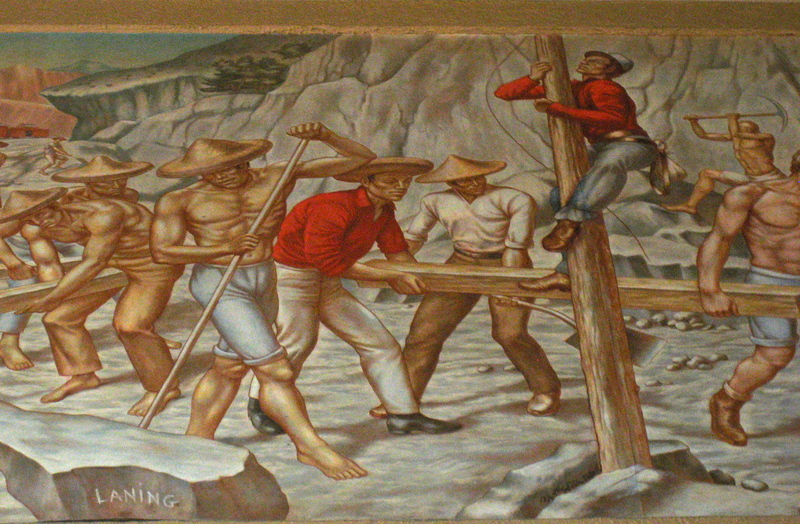 Similarly, many from China crossed the Pacific in search of stability and work. The initial wave of Chinese immigrants arrived in the 1850s to try their luck in the Californian Gold Rush, or as they termed it: 金山, “Gold Mountain” (“gam saan” in Cantonese). More came in the 1860s to build the Transcontinental Railway. These men–they were nearly all men–came from Guangdong Province. They were pushed by the unrest of the Taiping Rebellion and pulled by the hope of (relatively) high wages to send home to their families. In 1864, the Central Pacific hired James Harvey Strobridge to supervise workers on the rails. He was a workaholic with a hot temper and sharp tongue — good attributes for the job. Strobridge soon learned that workers imported from the eastern states were loyal only until they were paid. Then they deserted to the gold or silver mines. The Civil War also took workers away into the military. The Central Pacific’s leaders saw California’s Chinese population as the solution. Strobridge disagreed. He thought the Chinese were inexperienced and too small for the heavy work. But he discovered that the Chinese worked hard with few breaks and without complaining. A write-up that is informative, colorful and patronizing all at once. 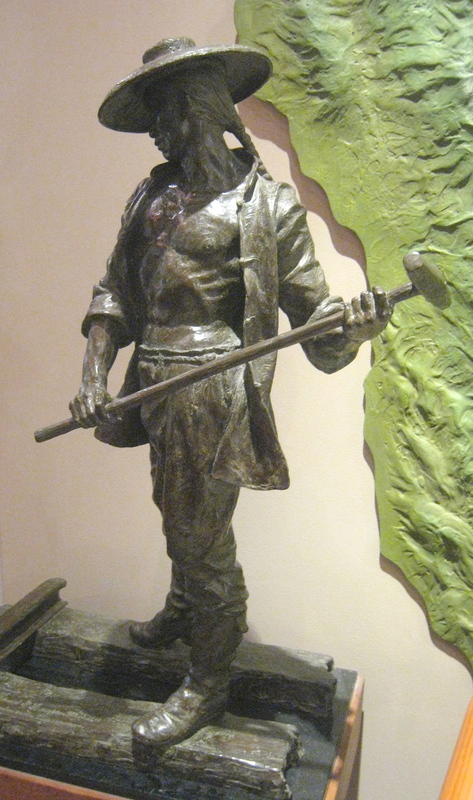 While some of these laborers came directly from the California gold mines, others were recruited from China on a term basis and intended to return home. Some did return to China either voluntarily or forcefully (see, for example, the shameful Anti-Chinese Seattle Riot of 1886 which resulted in the ejection of 200-300 Chinese from the city). Others persevered and made new lives for themselves in America. Chinese arrivals (like all arrivals at the time) increased, and in 1880 there was an ethnic Chinese population of 105,000 in America. Unions complained, people who feared the “yellow peril” complained, and America passed a hugely racist piece of legislation, the 1882 Chinese Exclusion Act, which specifically barred a class of immigrants based on race. As a result of the Act, Chinese men, who often initially came to America on their own, could not bring their families to a join them. Furthermore, the law restricted Chinese residents from leaving and then returning to America and barred them from becoming naturalized US citizens. This restriction was in place until 1943, when China allied with America during World War II and the legal bar to Chinese immigration became a clear diplomatic embarrassment. Chinese were excluded from entering American for 60 years, a period during which European immigrants hit the shores like a tidal wave. Imagine how completely different the ethnic composition of America would be today had Chinese immigration been allowed during this period? Would Panda Express have more locations than McDonald’s? Would it produce edible food? Would suburban housing developments be called things like “Hangzhou Gardens” rather than “Somerset Farm”? As it stands, the ethnic Chinese population dipped to a low of 61,000 in 1920, re-bounded to 118,00 in 1950 and now stands at 3.3 million, about 1% of the US population. The next time I’m tempted to complain about China’s opaque and ever-shifting visa policies for Americans, I’ll reflect on the 1882 Exclusion Act and be glad I can enter at all. And the next time someone talks about America’s great historic ethnic “melting pot” I’ll remember who was sharply excluded. Population statistics from the US Census via Wikipedia here. Information on the Transcontinental Railway and Chinese participation in construction here, here and here. 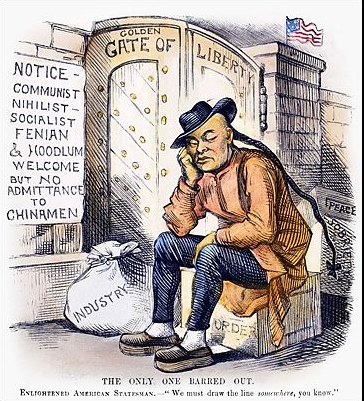 Information on the 1882 Chinese Exclusion Act via the US Department of State here. Going through the opaque visa process as we speak I am not quite as willing to forgive Chinese process, but great article on how history can shape the present. What if? Best of luck with your new visa. It’s not as bad now as how it was during the run up to the 2008 Olympics, is it? No, not at all, however it now takes 4 weeks and there are some tougher definitions. It is more the inconvenience of it. You would think they would have a fast lane for people here over a certain period of time! I learned a lot writing it. A fascinating and utterly shameful bit of history. I wonder if they teach it high school these days? Maybe in Seattle. I only learned about the Chinese Exclusion Act as part of an optional immigration law class in law school. Agreed that it’s an incredible and largely unknown part of American history. Was there an all over jump in Chinese immigration (incl from Taiwan) in the late 1960s? Is that when they changed the per country quotas? Thanks for digging this all up. Simultaneously bleak, embarrassing and fascinating. Shameful is right. Not long ago, I visited Sutter Mill in Coloma, which is right by where I grew up. 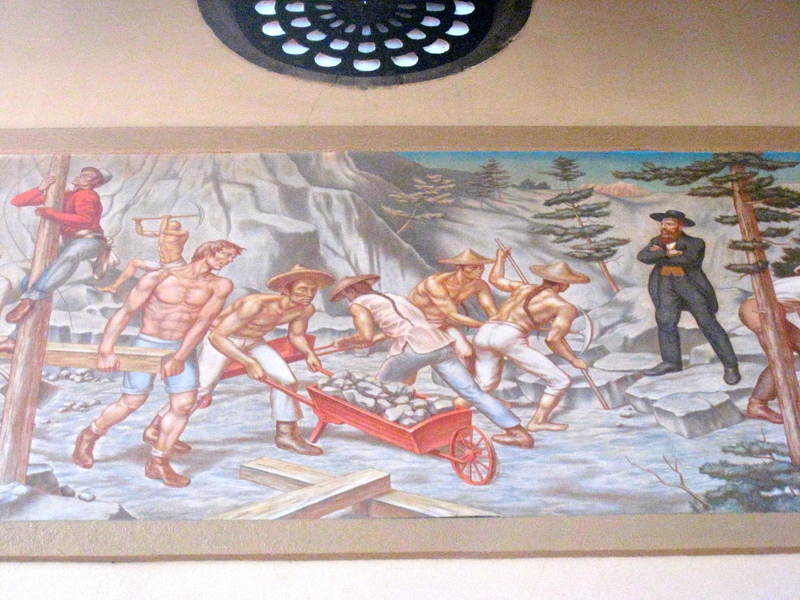 It’s where gold was discovered in California, and I was fascinated upon my visit to see Chinese buildings and pictures of the Chinese working in the mines… Things I’d never payed much attention to before… Exclusion in any form is terrible. Thanks for liking my post about Bandung! 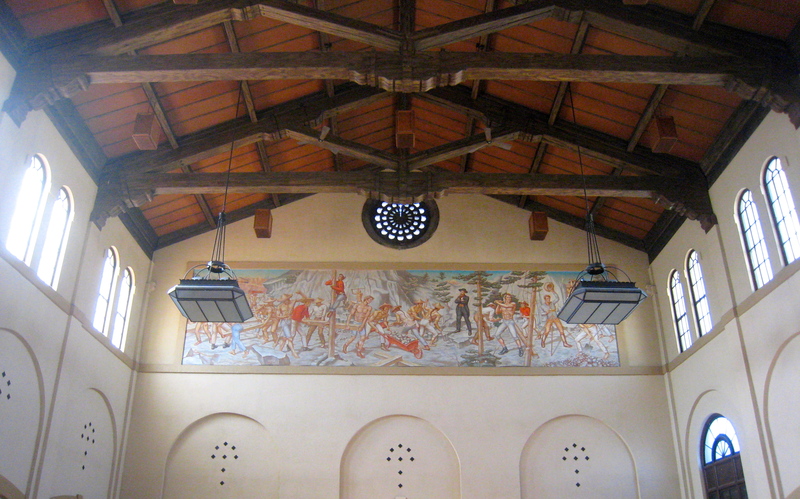 Have you visited any particular architecturally pleasing college campuses (abroad)? When I first moved to Seattle in 1997, I was also taught to call it the “ID,” but now I see they’ve started calling it “Chinatown/International District.” A little sleuthing reveals that the Chinese community was never thrilled with the name “International District” so the name has swung back the other way. The same thing happened in Canada. It’s a shameful part of our history. Interesting that Canada did the same thing. Ugly. I didn’t know the US was so exclusionist to the Chinese till I read your post. I also have a so-called Chinese caps with a fake braid running down the back, which I purchased in HONG KONG. It’s ironic that a Chinese vendor in Hong Kong would perpetuate this rather derogatory Chinese stereotype of himself (like the picture of the Chinese man in The Society Pages) just to make a few bucks. Maybe it’s not seen as such in the East, since it was basically made into a stereotype in the West only. Possibly, but it certain cuts a bit close to the “coolie” image for comfort! Next time we meet, you wear the China cap with braid and I’ll wear a prairie bonnet and floor length pioneer girl dress. We’ll re-enact a scene at the Chinese buffet.